Members of the Canadian charitable organization, Sleeping Children Around the World, and volunteers of the Rotary Club of Pune Cantonment distribute sleeping and school kits to children in Wagholi on Sunday.Pune, India: The Canadian charitable organization, Sleeping Children Around the World (SCAW), joined hands with the Rotary Club of Pune Cantonment to distribute 600 sleeping and school kits to needy children in Wagholi and Mulshi, on the outskirts of the city, on Sunday. 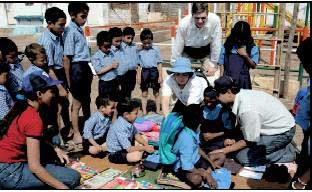 Members of the Canadian charitable organization, Sleeping Children Around the World, and volunteers of the Rotary Club of Pune Cantonment distribute sleeping and school kits to children in Wagholi on Sunday. SCAW was founded by Canadians Murray and Margaret Dryden in 1970 and till February 2002, has collected over $15 million to provide sleeping kits to over 600,000 children in 31 countries world-wide. Typically, SCAW donations provide sleeping kits to children of any race/religion in underdeveloped and developing countries. Each $30 donation (Rs 1,130) provides for a sleeping kit that consists of a mat or mattress, pillow, sheet, blanket, mosquito net (if applicable), school uniforms, undergarments, shoes, school supplies and a towel. Veteran Mumbai-based Rotarian Shamaldas Parekh (82), who is traveling in Maharashtra and Karnataka with the Canadian team and has collaborated with SCAW for the last 25 years, said the first-ever Indian distribution was done at the St. Crispins home in Pune in 1971. SCAW joined hands with the Rotary Club of Pune Cantonment in 1995 and has been carrying out distributions in Pune for the last 10 years. According to Rotarian Nitin Shah, over 5,000 children have been given sleeping kits in the last 10 years in Mulshi, Wagholi, Malavli, Markal, Phursungi, Katraj and Pune city areas. Shah said preference was always accorded to the needy, school going children in the age group of 6 to 10. We are confident that the sleeping and school kits will encourage children to stay within the school system and keep them away from work, says Shah. On Sunday morning, 232 sleeping kits were first distributed by SCAW and Rotary teams to the children of stone quarry workers at the Pashan Shala, run by the Santulan group in Wagholi. This was followed by distribution of kits to 25 Kashmiri orphans from the Kamshet English school and 129 children of the Ashram Shala, a school for orphans and destitutes at Wagholi. Four students and two teachers of the same Kamshet school had perished last year in a fire caused by an LPG tanker, which had run into the school premises. After receiving the kits, the children of Ashram Shala could not hold back their joy. They sat in neat rows and cheered their benefactors. Geetanjali Thakre (12), a class V student of Ashram Shala, said, I am very happy to get the sleeping kit. Im sure I will be comfortable tonight. When I grow up, I want to become a doctor and serve the poor people of the world. Her classmate, Renuka Pujari (12), said, I love school very much. English is my favorite subject. I want to become a teacher and take care of orphans like me when I grow up. It was obvious that the days events had touched a chord in the hearts of the SCAW team. Ted Swanston, a resident of Toronto, on his fourth visit to India, said, Its a privilege to help the needy children of India. The children at the stone quarry were so poor. We hope our kits will make their lives a little more comfortable. According to Ted, every SCAW volunteer incurs his/her own traveling and lodging-boarding expenses. Every single dollar is put into the sleeping kit. We do not take anything from the organization, Ted said. After distributing another 214 kits to children from the villages near Mulshi on Sunday afternoon, the SCAW team was traveling to Belgaum, Hubli, Ranebennur and Kundgol in Karnataka for more distributions.